I now own 21 fly boxes. 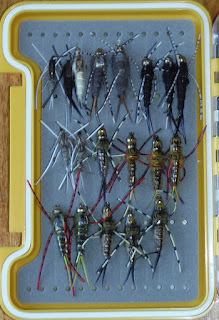 Not that I need another, but I bought a good number of stonefly flies at Nile Creek Fly Shop and got another box in the process – they display so nicely. Stonefly flies have become popular in the past five years because they catch a great number of Vancouver Island salmonids. We are fortunate to live in an area where we have both resident and anadromous salmonids. The former spend their entire lives in freshwater, the latter spend time in both salt- and fresh-water. Resident fish key in on the actual food and thus prefer a fly that mimics those insects. People all across the country know only resident fish and know well that such fish can be extremely fussy, preferring, for example, only one species of Mayfly nymph, and if you don’t have the pattern, you will not catch fish. The problem can be even more difficult for dry flies that mimic adults, particularly their size. Anadromous fish on the other hand, feed on ocean feed for part of their lives, feed that may not have any freshwater look alike, and then feed in freshwater on what they find. The important point is that they are less selective about what they will glom; that is the reason we use attractor patterns for steelhead. They feed aggressively, and that colourful chunk of ‘food’ swinging quickly across their vision stimulates an instinctive feeding/aggression - we don’t care which - whack at the fly. The speed with which the patterns move also makes the fish make an immediate decision to bite, rather than leisurely picking off a tumbling bug, some of which they may miss anyway. And that is where stonefly patterns come in. There are stoneflies in the water, along with Mayflies, Damsel flies, Caddis flies and so on. And specific nymph patterns are all for wet fly fishing rather than dry fly fishing, an important distinction. The technical form of nymph fishing is sometimes called: high stick nymphing. On Van Isle there are many rivers where you can do this in the late spring, the Elk being a well-known example, but only one of a number of such fisheries. Get out there and look for others. 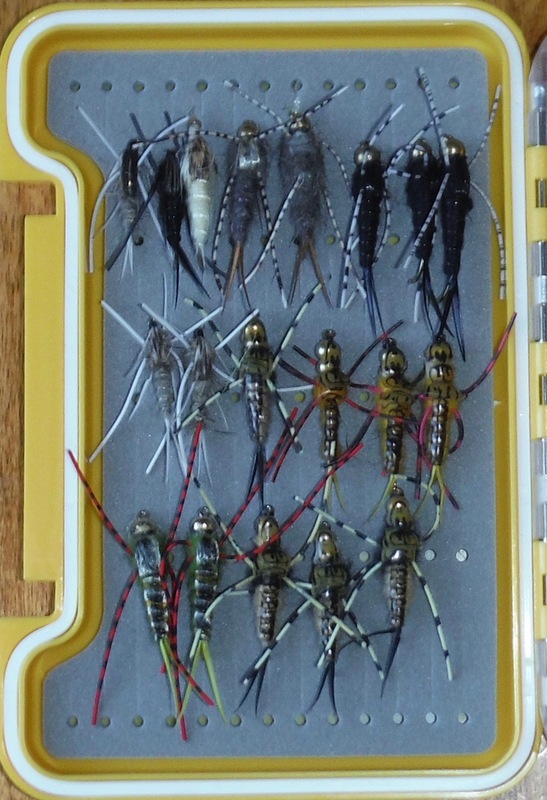 While you can buy stoneflies of any size, or make even smaller flies, actual stoneflies are often larger. I use size 2 to 8 hooks (and mostly 4 and 6) and simply pick up a bunch of different colours, with or without carapaces, and wriggly legs, based on past success. Technically they are called searching patterns, but one that mimics a lot of food in the water, and targets fish that feed on a variety of food sources in the ocean and rivers. So, stoneflies will catch cutthroat, Dolly Varden and steelhead along with some resident fish. I think the larger size works better for fish that have max a second or two to see the fly and attack it. Large is better in the swing. Technically nymphs don’t ‘swing’ but any kind of volitional food swims, and thus swing/strip is the action of a living thing. Stoneflies are used in the warm months. Look at the rocks at your feet. You want algae, that slippery stuff – but not didymo – and to find nymphs eating their way across the rocks. Most rivers will have nymphs from May to September. Once you see there are no more nymphs, it is time to move to a different fly. Also, when salmon come in, they push other salmonids aside, and make them switch to target salmon eggs. It is quite distinct when the season’s nymphs are all hatched that anadromous fish stop biting on stonefly flies, and it is time to switch to attractors that prevail through the winter until May when you once again see the new season’s nymphs on the rocks. And switch to dry flies only when you see fish on the surface. Also note that in canyon rivers, ones that receive melted snowpack, and infertile ones, you will find that attractor patterns out-fish nymph patterns. Part of the issue is the extra water, flash floods, and no algae for nymphs to eat. Extra water has these effects: there is more volume and thus the concentration of fish is lower; the water is moving faster and prevents fly penetration; and, it erases choke points that are key for catching fish. Fish are on the downstream side of a choke point (or in the tailout above), and in most rivers, other than canyon ones, these can be as much as a half mile apart. Get to know your river, get to know it’s hotspots. And make haste between them. Note also that higher water means the danger of being swept away is greater. In addition, fewer spots allow you to cross. And because river beds change over the winter, you need to make sure each spring that where you want to cross still is a crossable spot, and not another foot or two deeper. And, if you can only cross a river here and there, take account of that fact in planning your day. It may be better/safer to bushwhack into a spot, come back to the trail, and bushwhack into the next spot. Finally, choice of fly line is important. Full sink for winter rivers, with their deeper, faster water. Use a long sink tip fly- and sinking running- line for the crossover months, and finally, a floating line with a lighter sink tip for lowest water. Take along a second reel with your choice of a second fly line. It is very annoying to find yourself hitting bottom with a line with too much sink, and breaking off flies, as well as leaders and attached sink tips. The stretch of fly line – as much as 20 feet – that results from being stuck on something that won’t give way, can ruin it.